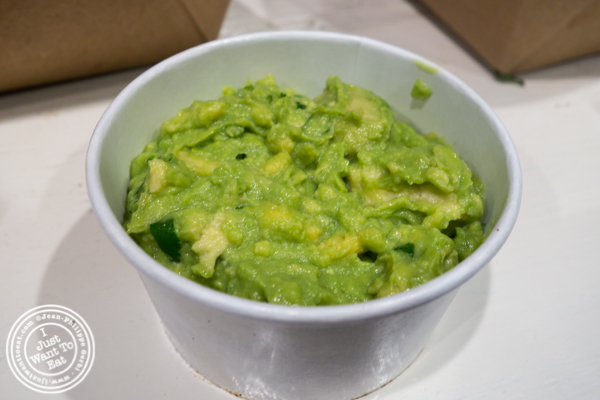 I’ll start with my least favorite that was a bit of a surprise when it comes to disappointment: the guacamole. Made fresh, it was missing seasoning. What? A Mexican place that does not know how to make guacamole? That could have been a bad sign if the other dishes were not delicious. For Jodi, the cheese quesadilla that had quite a lot of cheese in it. For me, the al pastor taco: this was sublime! The pork is cooked rotisserie style, like you would cook meat for a kebab, giving to the meat a nice char but without drying it out. It was filled with pineapple that added a delightful sweetness, onion and cilantro, drizzled with a cilantro sauce. The second taco I had was the baja taco, that is battered white fish with cabbage, tomato, cilantro, onion and chipotle sauce. This was delicious too: the fish was well cooked, crunchy on the outside and there was a nice balance between the quantity of fish and cabbage. The fact that there was a lot of sauce on it which helped make it not dry and very flavorful. Overall we had a great meal at The Taco Stand: the food there is unpretentious but very good, comforting and seems authentic. I definitely recommend it!